In The Butcher of Leningrad, the lives of American journalist Jack Land, Russian mobster Vladimir Szlotov, and Siberian girl Galina Yosheva come together in a deadly series of intersecting events. Eight-year-old Galina Yosheva is sold by her grandmother to a man in St. Petersburg who treats her like a slave. Running away as soon as she gets the chance, the little Siberian girl falls in with a band of homeless children living in the sewers, getting a fast education in stealing food and avoiding the body snatchers. Galina becomes the subject of Jack’s article, where he accuses the Russian Mafia of killing her. But Galina is alive, always just one step ahead of a certain death. Mafioso Vladimir Szlotov, the number three man in St. Petersburg’s Tambov Syndicate, has vowed not to end up like his father, a butcher worked to an early death when St. Petersburg was called Leningrad. Szlotov is a co-founder of the Tambov mob family with the dangerously demented Dmitri Zortaev. Jack’s article has put terrible heat on Szlotov. There is only one solution—Zortaev must die. As he plots the assassinations, an idea comes to Szlotov…an idea so horrific that St. Petersburg will never be the same once his plan is put into operation. 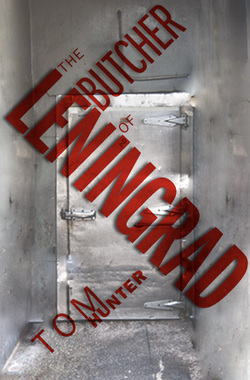 The Butcher of Leningrad will take readers into the deep, dark recesses of a Russia still struggling to come to terms with life in the post-Soviet era, an intense look into the heart of the people of Russia, from the kids casually thrown away by their parents to the very worst criminals—all struggling to survive with only two choices—life or death. Tom Hunter is not the bland American pseudonym for a Russian writer, but an American who worked as a journalist in Russia and lived for a time in Brighton Beach, Brooklyn, where he was the only English-speaker in his apartment building. A software engineer, Hunter currently lives in Indianapolis. He loves Russia and her people, but he’s as American as baseball and apple pie. The Butcher of Leningrad is his first novel.